Table of Contents Next: Hester, John H.
Edmund Herring was a Rhodes Scholar (1912) who joined the Officers' Training Corps at Oxford just before the First World War broke out. He was commissioned into the artillery and served in the British Army in France and the Middle East. He returned to civilian life after the war, completing his law degree at Oxford before returning to Australia and becoming a successful barrister. He was active in Conservative politics and was a member of the White Guard, a secret anti-Communist organization. However, he became active in the Australian militia and was a friend of Thomas Blamey. Herring was called to the colors in 1939 as commander of the 6 Division artillery. He served as commander of 6 Division in North Africa, though not in combat, and returned home with it in February 1942. He opposed Blamey's appointment as commander of Australian military forces, but this did not destroy their friendship. Later that year Herring was appointed commander of Australian troops in New Guinea, a largely administrative post, in place of Sydney Rowell, who did not get along with Blamey. 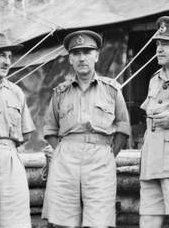 Herring took command of I Australian Corps in August 1943 and led the Australian troops who fought in the Papua campaign, surviving an aircraft crash on 28 September 1943 uninjured. That same month, he confirmed the death sentences of 22 Papuans convicted of murder and treason, which created a controversy when made public in 1978. Herring also created controversy in his relations with Savige, the commander of 3 Division, and Barbey, the American 7 Amphibious Force commander. It may be for these reasons that Herring retired from the army in 1944 to become chief justice of Victoria, in spite of having no prior experience as a judge. Herring also served postwar as Lieutenant-Governor of Victoria (1945-1972) and as Director of Recruiting during the Korean War (1950-1951). The official Australian war historian described Herring as "small and quiet" but with impressive diplomatic skills. Intensely competitive, he also had the knack of thoroughly dressing down a man without raising his voice. Retires from the Army. Becomes chief justice of Victoria.